I took these photos while sitting in the car at lunch yesterday. You can often find me with my knees propped up against the steering wheel. Is it odd that I love taking my own photo? Because I DO! I’ve so enjoyed this photo project. It’s been fun to figure out how to best capture the day’s photo subject. 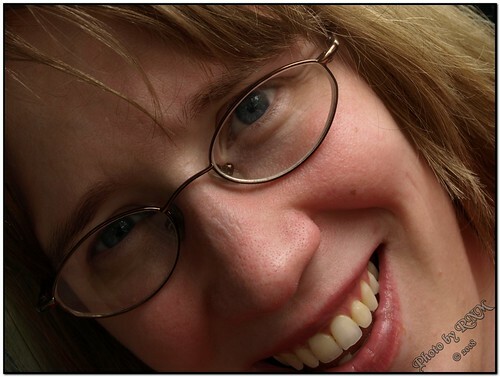 This entry was posted in Photography, Show Me... Project on September 13, 2008 by ramblingsbyreba. Today, Mr. Robert wants us to show him something that is relaxing. I thought about photographing a big pile of books or posting a shot from my trip to Stone Mountain to hike earlier in the week. Then I noticed this while walking down the hall at work. 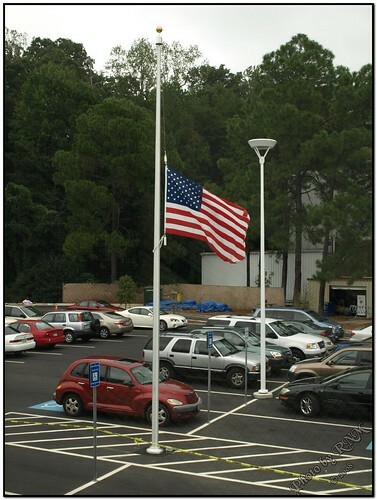 Our refurbished office has a brand spanking new flag pole. 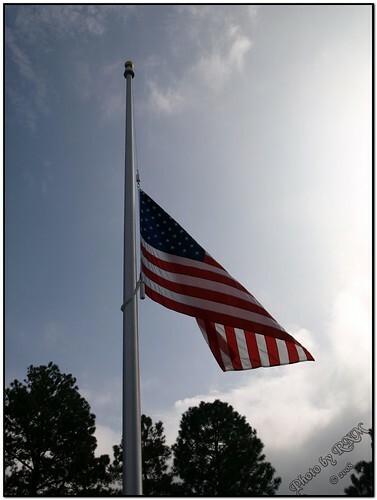 Yesterday the flag was at half-staff for Patriot Day. Tomorrow I’m supposed to show myself… a self-portrait. See more Show Me… Project participants at Thoughts of a Father. This entry was posted in Photography, Show Me... Project on September 12, 2008 by ramblingsbyreba. Today Robert wants to see our favorite view from our homes. I love watching the moon. I often look for it in the morning when I leave for work… It makes me happy. 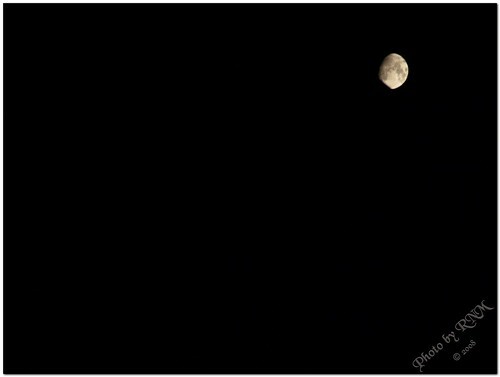 Wherever the moon is, that’s my favorite view, particularly when I can photograph it. Oh, please check out Blissfully Domestic’s photography channel. Full disclosure time: I am a contributing author for the site, which recently relaunched. My first column, which was about cropping to improve viewer’s focus, was published yesterday. This entry was posted in Photography, Show Me... Project on September 11, 2008 by ramblingsbyreba. 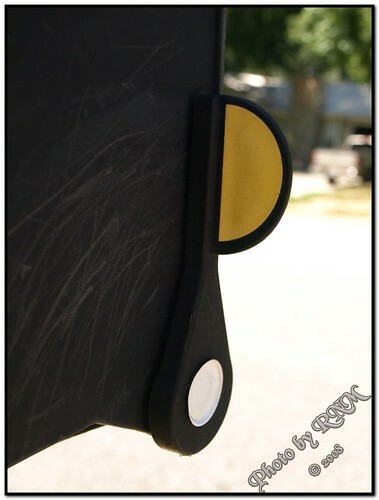 For today’s Show Me… Project subject, Robert wants us to show him an object or objects that have sentimental value. 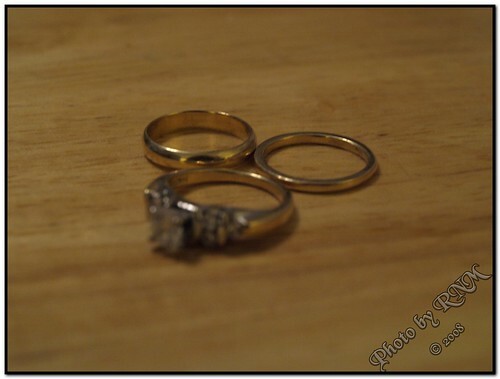 These are my engagement ring, my wedding band… and my father-in-law’s wedding band. (His band is at the upper left.) My husband’s parents married in 1947. My father-in-law wore the ring until he died in 1993, after which my mother-in-law wore it. Three weeks before she died, she took it off her finger and gave it to my husband. We’d been married less than three months. Ed wanted to wear the wedding band I’d put on his finger on our wedding day. The ring wouldn’t fit on another of his fingers. So I suggested that I wear it. His mom loved the idea. 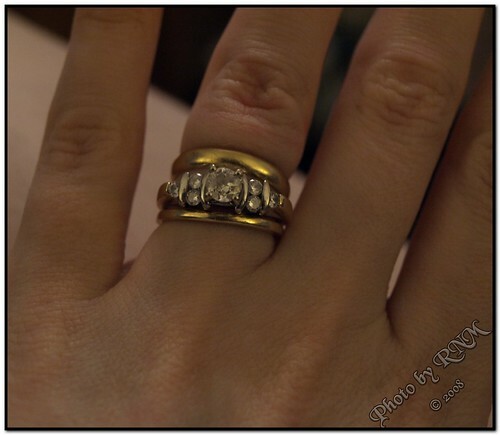 As my mother-in-law did, I wear the ring on the same finger on which I wear my wedding band and engagement ring. Each time I look at it, I’m reminded of the wonderful example of marriage my in-laws gave to my husband. 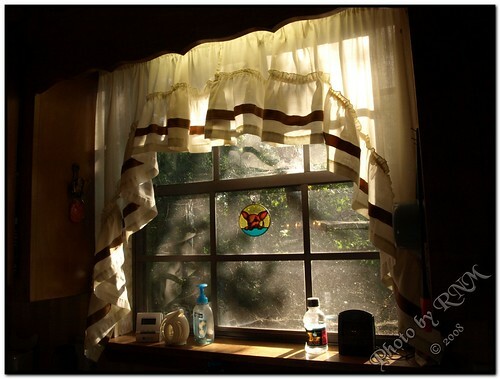 This entry was posted in Photography, Ramblings, Show Me... Project on September 10, 2008 by ramblingsbyreba. 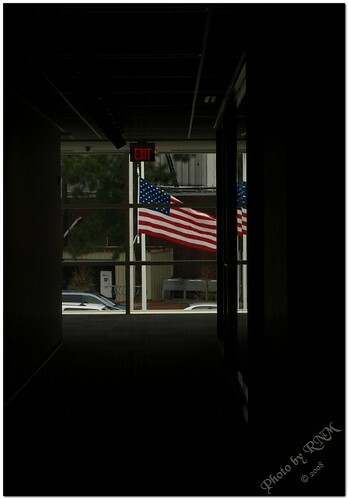 Today, Robert wants us to show him our front doors. 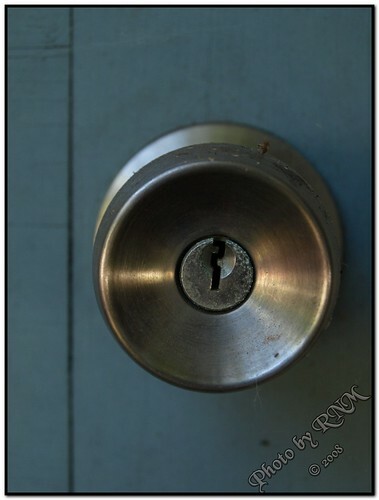 But I like its color… and I think the doorknob is actually the most important part of the door, because it allows us to see who lives there… the people we love. Show us your front doors, too, please. You can find the Mister Linky here. Tomorrow’s Show Me… Project subject is an object or objects that hold sentimental value. This entry was posted in Photography, Show Me... Project on September 9, 2008 by ramblingsbyreba. Today, as part of his Show Me… Project, Robert wants us to show him our kitchens. We have a humble kitchen… nothing spectacular, but quite functional. My favorite part is this window. The photo was taken yesterday just after 5:30 p.m. I just love the light. Toby has a favorite part of the kitchen, too: wherever the sunlight from that window happens to be hitting the floor at any given time. Toby, apparently, is part cat. 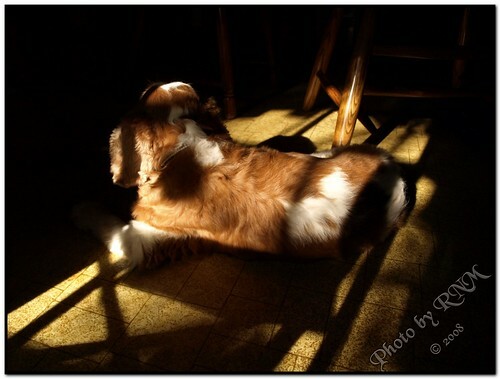 He loves resting in sunny spots, all over the house, actually. Tomorrow’s Show Me… Project subject is our front door. Join the fun! This entry was posted in Photography, Show Me... Project on September 8, 2008 by ramblingsbyreba. 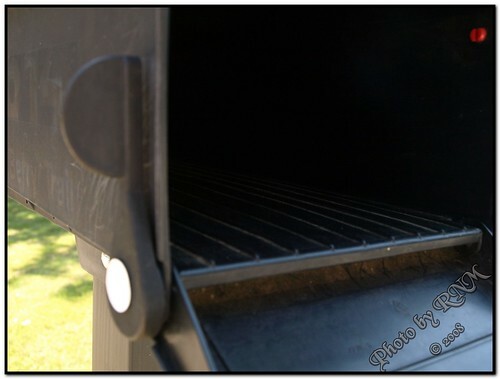 Today, Robert wants us to show our mailbox. Our mailbox also has a lever that raises when the box is opened. The really cool thing about this is it has a yellow sticker on the back, so you can tell from your home if the lever is up. I never thought I’d show someone the ins and outs of my mailbox. One of the reasons I like doing these projects is the challenge of making something that’s often mundane a little more interesting. 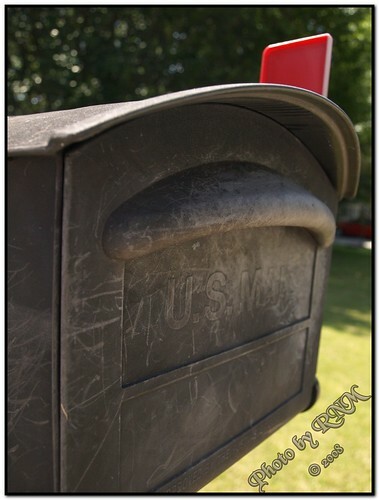 Go visit Robert and see other people’s mailboxes. Please join the fun. Tomorrow, we’re supposed to show our kitchen. Hmmm… I so rarely use ours, so just finding it could be the REAL challenge! This entry was posted in Photography, Show Me... Project on September 7, 2008 by ramblingsbyreba.